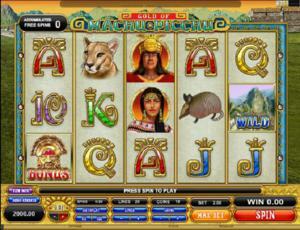 Gold of Machu Picchu is an online video slot machine game released in August 2012. It is offered exclusively at online casinos powered by Microgaming. This online video slot game has 5 reels and 20 pay lines. The theme of Gold of Machu Picchu is inspired by Machu Picchu, a historical place built by the Incan tribe around 1450. Most archaeologists believe that the Machu Picchu was built to serve as an estate for the Inca emperor named Pachacuti (1438-1472). Machu Pichu is probably the most familiar icon of Incan civilization, and it is often referred by many as the “Lost City of the Incas”. Learn more about the mysterious Incan civilization when you play the Gold of Machu Picchu online slot game! Microgaming online slot games are available to players in 2 formats – download and no-download. Whether you like to download their software first or you prefer to play instantly without the need to download, then Microgaming surely has online slot machine games to accommodate your every slot gaming preference. Gold of Machu Picchu is available for instant play, so you do not have to download anything to find out if this game interests you in a way that you would like to spend some real money on it. Gold of Machu Picchu is created for those who have a penchant for history and archeology of Incan gold, and the desire to win as much as they can in this particular slot game. The Gold of Machu Picchu online video slot game features scatter wins, a wild symbol, 2 fun Bonus Feature games (Llama Deification Bonus Feature game and the Free Spin Bonus Feature game), a Skill Stop Feature that allows you to stop the reels from spinning even before they stop spinning on their own, a maximum coin jackpot of 75,000, and a maximum cash jackpot of $37,500! The quality of the graphics and sound that Microgaming provides is absolutely incredible and top notch. They have an impeccable reputation of making the most eye-catching graphics and superb sound effects that will truly transport you to “that specific theme” they used in any of their slot games. Most people love to play games run by Microgaming software because they have smooth animation and engaging yet non-interfering sounds. In Gold of Machu Picchu, players are brought back to Peru’s ancient times when the Incans were once inhabitants of the land. The symbols are drawn in a realistic manner. All symbols are nicely animated when they are included in winning combinations. The main color used in this game is green, which means you will definitely not strain your eyes when you play this game for a long time. The overall graphic design of Gold of Machu Picchu shows players a lush green meadow where you will see from yonder (or at the top of the reels) the ancient dwellings of the Incans. When you activate the Free Spin Bonus Feature game, the daytime atmosphere of the game screen shall change into nighttime and distinct flute and drum music will fill your ears as the Free Spins are spun. The constant background music you will hear while playing this game mostly resembles the native tribal music of the Incans from long ago. When you spin the reels, “plinking” sound effect will be heard when the reels stop. Upbeat magical sound effects are programmed when you form winning combinations with the Wild symbol. Magical tribal worship sounds is played out when you form a winning combination with the Incan Virgin and the Incan Warrior. The card deck symbols available in the Gold of Machu Picchu online video slot game are 9, 10, J, Q, K, and Ace, and they are written in Incan-styled calligraphy to match the game’s theme. The regular symbols that you will find in Gold of Machu Picchu are the Armadillo, Cougar, Incan Virgin and the Incan Warrior. The Wild Symbol is the Mountain. The Mountain wild symbol acts as a substitute for all other symbols (except for the Scatter symbol) in order to you help you form winning combinations. You are paid varying prize amounts (refer to the Payout table) when you manage to form a winning combination with multiple Mountain wild symbols on an enabled pay line. The Scatter Symbol is the Llama. Scatter symbols mean that they do not need to appear in a line (on an enabled pay line) for you to win. The Llama scatter symbol can be found scattered anywhere on the 5 reels, and you are able to form winning combinations as long as there are 2 or more Llama scatter symbols that come out. Your winnings are calculated by multiplying the Llama scatter symbol combination payout (refer to the Payout table) by the total number of coins you’ve bet. Please take note that if you get a scatter win and a normal win, then you are paid out for both of these wins, because the Llama scatter symbol is not required to come out on an enabled pay line for you to win. The scatter win is included to the pay line win. If you manage to get the Incan Warrior symbol and the Incan Virgin symbol on the same horizontal line, one next to the other on the 4th and 5th reels, you will trigger the Llama Deification Bonus Feature game. One (1) Free Spin is accumulated for the next entrance to Gather Inca’s Riches Free Spin Bonus Feature game. If you manage to get 3 Bonus symbols on the 1st, 3rd and 5th reels in any position, you will activate the Gather Inca’s Riches Free Spin Bonus Feature game. At the start of the bonus game, you enter a picker screen where you have to select 1 of 4 options that represent the Inca’s work. In the Free Spin Bonus Feature game, the symbol revealed that you’ve picked shall be paid with a multiplier amount. Only combinations of the symbol revealed in the picker screen are multiplied by both, the multiplier and the average line bet. All other symbols are multiplied by the average line bet. An average line bet is used inside the Free Spin Bonus Feature game considering the sum of the total bets of the plays in which the Llama Deification Bonus Feature game awarded 1 Free Spin, plus the total bet of the triggering combination multiplied by 7 (default Free Spins). While playing the Gather Inca’s Riches Bonus Feature game, the Incan Warrior and the Incan Virgin on the same horizontal line, one next to the other on the 4th and 5th reels shall trigger the Llama Deification Bonus Feature game and 1 extra Free Spin is awarded to you. Winning symbols must appear on active pay lines and on adjacent reels, starting with the far leftmost reel. Only the highest winning combination on a pay line shall be paid out. Only one win per pay line. Once the Gather Inca’s Riches Bonus Feature game is over, you will be taken back to the main Gold of Machu Picchu online video slot game, and your bonus wins are included to your balance. Gold of Machu Picchu has 5 reels where you may bet on 20 pay lines. The minimum bet is 0.01 and the maximum bet is 0.50 per pay line. You can wager 1 up to 15 coins per pay line bet. Therefore, the maximum bet amount is 150.00 per spin. Please take note that the amounts mentioned are in Pounds, but they will remain the same if you choose to play in US dollars, Euros, or Canadian dollars. Also, for every coin that you wager, you will enable another pay line. You will be paid out for winning combinations on enabled pay lines only. The maximum payout in the regular Gold of Machu Picchu online video slot game is 3,750 coins per line bet. People who regularly play online casino games naturally love to stay longer on online slot games that have an Autoplay function. Good thing that Gold of Machu Picchu is furnished with this function! You can have the game spin automatically for you with the Autoplay function that can be found by clicking the Autoplay button (located at the lower left portion of the game screen). After customizing the Autoplay function to your preferences, just click on the Start button, and the game will automatically spin for you while you just sit back, relax, and enjoy playing this Gold of Machu Picchu-themed online video slot game!